This one hurts, it really hurts. I happened to be awake in bed and staring at my alarm clock when I saw a news alert light up my phone around 6:00 this morning. I didn’t have my glasses on, so I squinted and read “Musician David Bowie has died after an 18-month battle with cancer.” I blinked and squinted again, unsure of what I had read, sure I had read it wrong. I reached for my glasses, put them on and read what was the sad shocking truth. I threw my glasses off and cried for the next two hours. The last two months have been difficult while my mom has been in the hospital. I have stayed strong for her and haven’t ‘cracked’ yet, but upon hearing about Bowie’s death, my wall crumbled and my emotional dam burst open. I cried for Bowie, I cried for my mom, I cried for all of it. I became aware of Bowie in 1983 when he was all over MTV with videos from his ‘Let’s Dance’ album (Modern Love; Let’s Dance; China Girl and Blue Jean). One weekend in the summer of ’83, MTV aired the complete Ziggy Stardust film. I stumbled upon it, alone in my basement and watched, mesmerized. I found it hard to believe that this…this being I saw onscreen was the same person in the suit in the ‘Modern Love’ video. This 1973 film, as flawed as it may be, is the reason that Ziggy Stardust has always been and always will be my favorite Bowie record. I have other albums by him in my iPod, and the two disc collection ‘Sound + Vision’ gets a lot of time on my iPod, but I always go back to Ziggy Stardust. Even the stuff I don’t particularly like (Tin Machine, for example) I have and listen to occasionally because, even though it’s not my favorite, I know there’s something there worth listening to and appreciating. Today was very difficult to get through at work. I listened to Bowie all day. 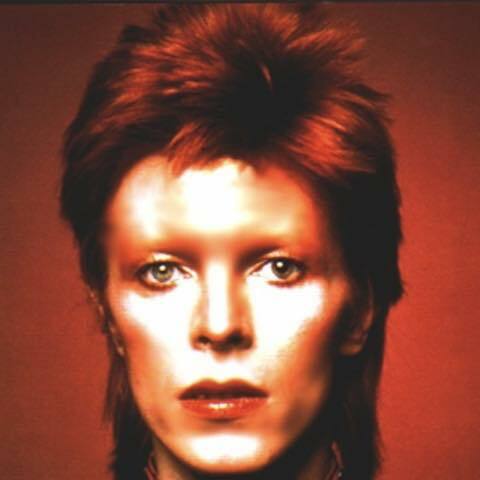 The first listen today of ‘Ziggy Stardust’ had me fighting back tears for the entire record. Then I played ‘Sound + Vision’ and when ‘Life on Mars’ played, I found myself singing along. By the time ‘Rebel Rebel’ hit the chorus, I was tapping my feet and smiling. I’m still crushed and devastated, but he had me smiling. There are certain people you firmly believe will live forever. I still can’t believe Lou Reed isn’t walking the streets of New York, and it’s impossible for me to imagine that Bowie isn’t here anymore. I am eternally grateful for his music, and because he left us so much great music and so many films, I know he’s not really gone. Tonight that doesn’t make his death hurt any less.